It was suggested in our November AGM that it might be an idea to keep just a little bit of pressure going after our busy exhibition in February 2016 by producing a small collaborative piece to be completed for the next annual meeting. 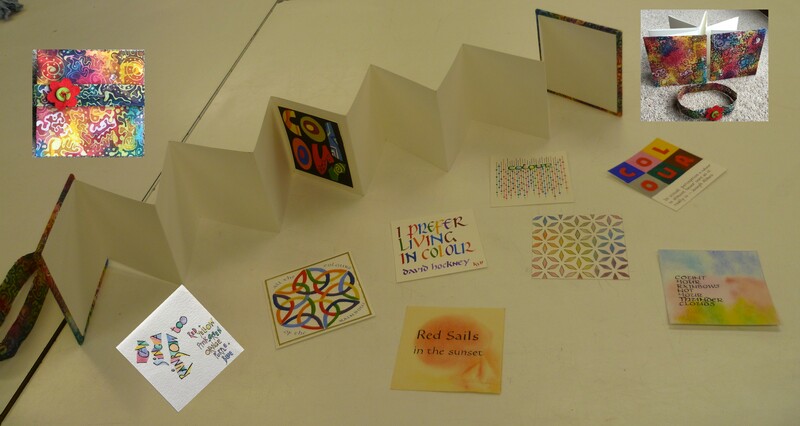 …… to produce a small page of calligraphy (size 9cm/9cm, the same as our Transformation/Trawsnewid letters that went into the black and white frames) to be included in a concertina book that members can borrow in the future for ideas and inspiration. The title for this is ‘Colour’ and you can interpret it in any way you like using any calligraphic style, illustration, text and medium. The only thing to be aware of is that it will need to be fixed onto a page in the book and the book must be able to fold together neatly before fastening. Let your imagination and calligraphic talents run free and see what you can come up with. This isn’t a competition, it’s just something small to keep us working as a whole like we did last year – I for one found it very enjoyable being part of such a creative team. We hope that every SWS member will try to take part and complete their page ready for the November AGM as it will be put into the prepared book on the day. If you don’t think you’ll be there due to holidays etc just send your page through the post to any of our committee members and they can bring it along for you – so no excuses. Don’t think of this as a chore, use it as a creative springboard and mwynhewch/enjoy.